This DigitalGlobe 50-cm-resolution natural color image of the North Korean launch site at Tongchang-ri, in the northwest part of the country, was taken March 28, 2012. DigitalGlobe imagery confirms a higher level of activity within the overall facility and significant activity at the launch pad specifically, ahead of a satellite launch planned between April 12 and April 16. North Korea says it is gearing up to launch a satellite to orbit this month, a move that has drawn widespread international condemnation. The satellite launch is expected to take place between April 12 and April 16 aboard an Unha-3 rocket, from a new site called Tongchang-ri in the northwest part of the country. Officials in the United States, South Korea, Japan and other nations view the liftoff as a thinly disguised military missile test. The concern stems in large part from North Korea's famous unpredictability, along with its status as a nuclear-armed nation. And the unease is heightened by North Korea's secrecy, which makes it hard for the West to figure out just what the country is up to, and what it's capable of. The next step was the 83-foot-tall (25-meter) Taepodong-1 booster, which experts believe is a two-stage missile with a Nodong first stage and a Hwasong-6 second stage. 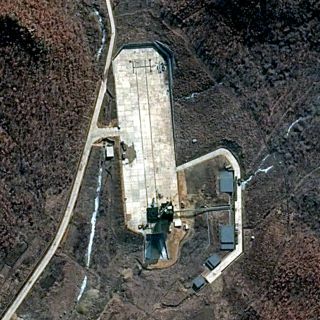 The Taepodong-1 rocket has flown once, in a modified space launch configuration that added a third stage. In August 1998, it blasted off carrying a small satellite called Kwangmyongsong-1 ("Bright Star 1"). Western observers say the launch failed, but North Korean officials claim the satellite made it to orbit and broadcast patriotic songs into space. Analysts believe a two-stage Taepodong-1 rocket could deliver a 1-ton payload up to 1,500 miles (2,500 km) away. But additional modifications could bring more distant targets into range. "Some analysts speculated that a reduced-payload configuration could deliver a 200 kg warhead into the U.S. center and a 100 kg warhead to Washington D.C., albeit with poor accuracy," missile defense specialist Steven Hildreth wrote in a 2009 Congressional Research Service report. After the Taepodong-1 test, North Korean rocket scientists continued their research and came up with the Taepodong-2, which is believed to be a two-stage missile about 115 feet (35 m) tall, according to Hildreth. Like its predecessor, the Taepodong-2 has launched only once. That July 2006 test flight also did not go well, with the missile exploding just 40 seconds after liftoff. Experts are even less certain about this missile's capabilities than they are about the Taepodong-1 booster. Most estimates for its maximum range vary from 3,000 to 5,400 miles (5,000 to 9,000 km). If the longer-range estimates are accurate, the Taepodong-2 could conceivably reach the western coast of the United States. Illustration of North Korea's attempt to loft an experimental satellite to Earth orbit in 2009. North Korean officials claim success, but Western observers say the effort failed. In April 2009, North Korea attempted its second satellite launch when it lofted the Kwangmyongsong-2 ("Bright Star 2") atop a rocket called Unha-2 ("Galaxy-2"), an advanced, three-stage variant of the Taepodong-2. But the Unha-2's third stage apparently failed to ignite, experts say, and the satellite ended up at the bottom of the Pacific Ocean. Like North Korea's previous launches in 1998 and 2006, the Unha-2 blasted off from the Musudan-ri pad in the northeastern part of the country, then traveled east toward Japan. Rockets lifting off from the new Tongchang-ri site on the country's west coast will likely travel south, experts say, avoiding provocative low flyovers of other nations' airspace. Unha-2 is about 100 feet (30 m) tall and weighs 80 to 85 metric tons, according to physicists David Wright and Theodore Postol, who published an analysis of the rocket in the Bulletin of the Atomic Scientists a few months after the failed launch. The rocket's first stage apparently uses Nodong engines. The second stage appears identical to the old sea-launched Soviet R-27 ballistic missile, Wright and Postol wrote, while the third is very similar to the upper stage of Iran's Safir-2 launcher, strongly suggesting that North Korea and Iran have cooperated on their missile programs. The Unha-2 may also pose a potential threat to the United States. "In particular, our analysis shows that the Unha launcher represents a significant advance over North Korea's previous launchers and would have the capability to reach the continental United States with a payload of 1 ton or more if North Korea modified it for use as a ballistic missile," Wright and Postol wrote. Not much is known for sure about the Unha-3, but it's likely to be broadly similar to the Unha-2. Experts will have a better idea when, and if, it actually lifts off the pad next month.